New from Sakata – an early maturing variety with a good canopy and good fruit size right through the harvest – the fruit is very firm with excellent flavour – it has a multiple disease package including BW, Nematode, Fusarium 3, TSWV and more. A longlife tomato – it is a very vigorous grower with multiple disease resistance – fruit is high quality and shelf life is very good. A widely adapted tomato with an excellent disease package and fruit size – a favourite with the nurserymen for spec plantings. A longlife tomato which is compact in its growing habit and harvesting period – the fruit size is good as well as the leaf cover. Tomato – Salad – Indeterminate. A very widely adapted variety which can be grown in tunnels or in the open field – fruit quality is good and the plant has multiple disease resistance. 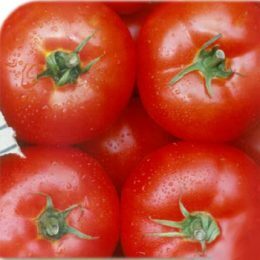 Excellent fruit size and quality – resistant to Tomato Curly Stunt and nematodes. Very good fruit quality which is very uniform in shape and size – the variety also has an excellent disease package. A variety which does well in the open field – some pruning needed to get good fruit size – it has an outstanding disease package including – BW, Bacterial Canker, Bacterial Spec and Spot. Can be used for processing because of the high brix or for the fresh market “Jam” segment – Legato has an outstanding disease package. Very high quality fruit with a high yield potential – the fruit is large with excellent shelf life. Very similar to Mariana with the extra benefit of TSWV and nematode resistance. A very good variety for winter production – the plant has good vigour – the fruit is large and of outstanding quality. Medium-sized fruit of high quality – Muriel is well suited for trellising – it has an excellent disease package including – TSWV, Spec and Spot and Alternaria. The leading baby plum variety in the market – it has an intense red colour with a high brix and a sweet flavour.